I'm working with someone who will help me control things a lot more and, I think, halt my diary slightly more. Hopefully, I'll gain control over the next couple of years and be able to fit in everything I'd like to do. The ideal situation would be to do slightly less, and everything slightly better, and have more time to practise, more time to develop, more time to learn. The problem Benedetti has on this new disc is that the main attraction is a rather familiar work, Mendelssohn's E minor violin concerto, op. 64. It does not sound like she was quite ready to record the piece, technically or interpretatively. (One has only to read the page of her comments in this CD's liner notes, spelling errors and all, to appreciate Benedetti's youth.) Her recent performances of the Tchaikovsky concerto have come in for similar criticism. The rest of the program is a series of inconsequential miniatures -- some pretty Mozart, two Schubert arrangements (including a saccharine Ave Maria with harp accompaniment), and a piece composed for Benedetti by the talented Scottish composer James MacMillan -- all of which, except the last, feel like padding. Benedetti has lovely moments, in some of the soft passages of the Mendelssohn, for example. MacMillan guides the Academy of St. Martin-in-the-Fields, an ensemble that has seen its reputation slide somewhat in recent years, in a capable and full-bodied performance. In the end, however, Benedetti's bravura and impetuous youth are not enough. On the other hand, it is good to hear her confronting more recent music. 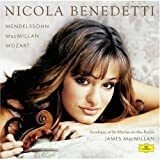 The MacMillan work, given its premiere recording here, is titled From Ayrshire, a reference to the region of Scotland where Benedetti grew up. Especially in its languorous first movement, it takes advantage of Benedetti's strengths, long lines, soft playing, and exotic, coloristic effects, the same characteristics that made her performance of the Szymanowski concerto so lovely. Judging from her own words quoted above, Benedetti knows what she needs to do at this point in her career, to let her remarkable talent blossom as it should. I am willing to keep listening, but you should feel free to skip this recording and hope for better things down the road.